The irony of Brian Anderson's decision five years ago is hard to miss. Selected by the Twins in the 20th round of the 2011 First-Year Player Draft following a standout high school career in Oklahoma, the then-18 year old was forced to make a choice: turn professional or attend the University of Arkansas. That he was able to make such a decision while citing his own perceived lack of maturity as the reason he chose college doesn't go unnoticed as the Marlins' No. 4 prospect looks back on that time in his life. "It was a serious decision," he said. "I had to consider all of my options. My family weighed in, but it came down to me thinking if I was really ready to go off and live on my own and take care of myself. I was barely 18 and from a small Oklahoma town [Edmond]. It was a tremendous honor to be drafted, but I felt that the best path forward was going to Arkansas." Anderson showed his potential with the Razorbacks, hitting .318 with 13 homers and 98 RBIs in 171 games in his first three seasons. Miami took notice and selected the infielder with their third-round pick in 2014. Two years later, he was a Florida State League midseason All-Star for the second year in a row, hitting .302 in 49 games for Jupiter before he was promoted to Double-A Jacksonville. "I just take it day by day," he said. "I know I'm getting closer [to the Majors], but I can't control what happens. I just keep my focus on what I can control and go out and work on whatever I can to improve my game. Whatever happens, happens, so I'll continue to take it one step at a time." The 6-foot-3, 185-pounder acquitted himself well in the Southern League, batting .243 with eight long balls and 40 RBIs in 86 games. But his first month with Jacksonville proved to be a steep learning curve for Anderson, who hit .185 in his first 25 games at Double-A. "As a position player, you look at the pitching and it definitely was better," he said. "It wasn't a huge jump, but you can certainly tell the difference. They mix it up and you're not seeing those 1-0 or 2-0 fastballs you might get in A-ball. They command the zone much better and can throw multiple pitches for strikes. So as a hitter, you just try and stay in your own zone and increase your plate discipline as opposed to just swinging hard and hoping." 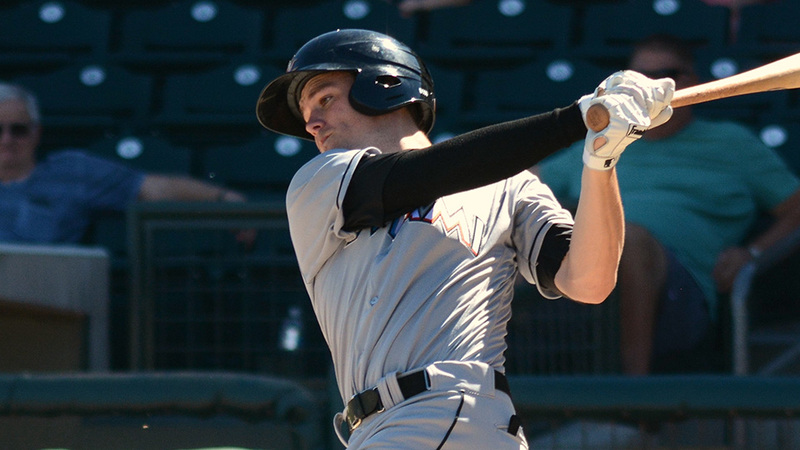 Despite that rough first month with the Suns, Anderson hit .264 with seven of his eight homers and 28 RBIs over the final two months of the year. Tabbed for a second stint in the Arizona Fall League -- he spent two weeks with Mesa in 2015 -- he's using the time to add to his versatility around the infield and to hone his defense, particularly at third base. "The Marlins made it clear they want me to work on my defensive consistency," Anderson said. "Just make the routine plays, get my work in and be as consistent as possible. My bat will have its ups and downs, but the defense needs to be solid. "I played a little bit of everywhere in college, including the outfield as a freshman and sophomore, but mostly at second. It was challenging to move to third, but I do like it and I've embraced it. I've gotten some great help and instruction that's helped with my development." In addition to getting work in with the glove, Anderson is hitting .333 with two homers and five RBIs in 10 games and is getting a chance to make new friends while learning the nuances of the game from different sources. "It's awesome," he said. "There's so many years of experience down here, whether learning from players or the coaches. There's just so much knowledge you can soak up -- it opens your mind to different ways of thinking. We're so lucky to be participating in this league and getting the opportunity to pick the brains of people, whether they have Marlins, Indians or Cubs jerseys on. They're ready and willing to give you the information you need." Having inched closer to the big leagues and more than five years removed from declining his first chance at a professional career, does Anderson still think he made the right decision by going to college? "I was able to gain experience and live on my own while being only a few hours from home," he said. "I learned how to take care of myself, how to handle responsibility and just mature as a person. It was the right choice." The Marlins think so, too. Desert revival: A frustrating season that included two stints on the disabled list conspired against Anthony Alford. Appearing in only 92 games for Class A Advanced Dunedin, the Blue Jays' No. 3 prospect slashed .236/.344/.378 with 117 strikeouts. Healthy again and competing against elite competition in the AFL appears to have brought out the best in the 22-year-old outfielder. Through 11 games with Mesa, Alford is hitting .293 with two homers, eight RBIs and three stolen bases. Something to Bragg about: On the surface, 2016 appeared to be a rather ordinary season for A's prospect Sam Bragg. The right-hander went 4-4 with a 4.29 ERA in 36 appearances for Double-A Midland, which won its third straight Texas League championship. But a deeper look paints a different picture for the 23-year-old. Bragg struck out 68 over 60 innings and held opponents to a .238 average. He's carried that performance into the Fall League, where he's allowed one run on six hits while fanning eight over 9 1/3 innings.